When I first stumbled on this website I just couldn't believe the standard of photographers and their work. I had given myself the entire of 2006 to get a ribbon and that was wishful thinking. To get a blue against the genius of photographers like Joey and elsapo is far beyond my expectations. As you can probably tell, I'm over the moon with this result - Thankyou so much to those that voted. I also want to publicly thank my wife and photography 'buddy', (manic35 - //dpchallenge.com/profile.php?USER_ID=44751) for all her help. Without your help baby, this photo would not have done this well by far. Okay, this is starting to sound like an Oscars speech...time to pull the pin! I must say I had a lot of fun with this one! Originally I had used the clone tool to substantially alter my shadow into the winged crusader. My wife in her wisdom told me I would be disqualified as you are only allowed minor cloning so I had to approach the problem from another angle. I took 4 meters of her black backdrop material and made myself a shadow. I placed the material on the driveway and then went back to the camera to take the shot. I had to run down steps and get in position for the exposure - Buy the end of the shot I was beat! The building is a local hospital and at one stage during the night security came out and wanted to know what the hell I was doing with a nine foot Batman cut-out in their driveway!! This is why I love DPC, I can�t remember the last time I did something so crazy in photography. Edit: This photo was taken with white balance set to 'Tungsten White Balance'. This is really great, probably on of the most inspiring fake shadow shot's I've ever seen.. Very, very nice! First time viewing this, just so cool, great idea and shot very well. Very, very cool shot, point of view, colors, angle, etc. This is one aspect of photography one can just not avoid loving. Excellent..What a great idea and you really pulled it off. Laughinggggggggggg I LOVE THIS, and your story that goes with it was just so funny. I enjoyed your comment as much as I did the wonderful fun shot! Well deserved. My little boys LOVE this shot (so do I). Great story too! Aaaahhhh...excellent!!!! Always know you're on a good thing if kids love it. Thanks! Message edited by author 2006-02-14 09:30:39. Totally awesome and well deserved. I love hearing how you did it and the guard thinking "Huh? What the hell?" LOL congratulations. Thanks, Jutilda - the guard thing was funny in hindsight but kind of a bad moment at the time!!!!! Cool!!! From one ex Brisbanite to another Brisbanite, well done! Message edited by author 2006-02-14 09:31:42.
cool idea. that green light area is an interesting juxtaposition with the main subject's lighting. very good, though i find it odd having him staring out of a closed parking garage. did he forget to get his parking pass validated at the movie? LOL - actually this was the only flaw in my plan but I was hoping no one would really pick up on it and just be too involved in the whole feel of the shot. But you managed to pick it!!!! BTW, I'm sure Batman goes to the movies too, you know! I absolutely love this picture. I would have voted it 10 if I could have. ROFL...the things we do for a ribbon. This is very creative! Congrats on the ribbon! Cool! Glad to see this at the top :-) what an awesome shot. Congrats on your first ribbon. Good story too! wow, this is a particularly creative image - added it to my favourites. An outstanding accomplishment by using your immdediate surrounding to create this stunning piece of work. Congratulations on your well earned blue! Ingenius set up and superb results - Congratulations on a most deserved first place!!!! Absolutely brilliant photo! Congrats on your 1st ribbon!! Cool concept and great image! Congrats! Excellent idea and shot! Congrats on winning the big one in a challenge with some very nice shots. LOVE this one. Batman is the best. Congrats on the win! This is over-the-top! Fantastic! Congratulations! incredible. i simply love it. I must ask your forgiveness. When I looked at your shot, I thought it was brilliant but a sure disqualification because of the obvious cloning problem. How wrong I was and how sorry I am. I gave hyou 5 and should have given you 10. You live and learn. I will in future rate a shot on its merits irrespective of if it might or might not be disqualified. I just watched Batman Returns for the first time a few days ago and thoroughly enjoyed it. I'm also a big fan of the animated series which I felt was some of the best animation on TV. I really like how the colors in the lighting match those in the movie so well. I ripped that movie to watch on my brand new PDA and that was when I realized how dark and tungsteny that whole movie is. I know it probably would have taken a fair bit of work to work out, but I would have liked the bottom furling of the cape to look a bit better. I actually liked the uneven earpeices. Excellent "outside the box". (sigh) If only I had thought of this... I believe a photo like this makes everyone rethink the amount of effort they put into their submissions. Congratulations!!! This is truly creative and I am amazed of the implementation! Congrats on your first blue ribbon, well deserved, way to go! Excellent shot. You had some great competition too. Well done and congrats. Awesome! Good thinking on the cut out. Congrats on the win. My top pic and the only 10 I gave out. I couldn't offer any improvement, nor do I think anyone could. You nailed it! Congratulations. Great job on the this shot! Congrats and well done ... good fun shot! Congratulations on your well-deserved blue! Amazing shot. I also gave this a 10. Such a wonderful capture. And I love reading the set up. Lots of work for this one. Very nice work. Congrats on your first ribbon. What an amazing photo. I gave this a 10 and I'm glad to see it won. Great imagination, and moreso, carried out with great class. Edit: Forgot to say... Congrats! Message edited by author 2006-02-10 00:07:32. Guessing the batman is a cutout? 10 from me and i really hope this wins. It's such a beautiful shot I might have scored it higher with just a normal shadow! 7. Pretty cool shot, one of the best in the challenge. The batman shadow perhaps a little too "solid" compared to the shadow that is coming from the grate so I am not surprised this had to be validated but nice work, got an 8 from me. Great concept. Good color and excellent lighting. Absolutely great choice of location in which to stage this shot - the mysterial industrial nature, the strong greens and yellows and the gritty textures are very suggestive of a futuristic sci-fi setting. I'm guessing the "shadow" is a black paper cutout into which your real shadow falls and is lost? Great composition, great colours, great textures, great lighting, great idea! Very cool shot - great job! That is fantastic. Great setting, colors and subject. Brilliant idea, and awesomely executed. The first 10 of this challenge. very cool lighting and point of view. I'll be interested in finding out how you created this one. Wow, how did you do this one. Very nice compostion, good lighting. 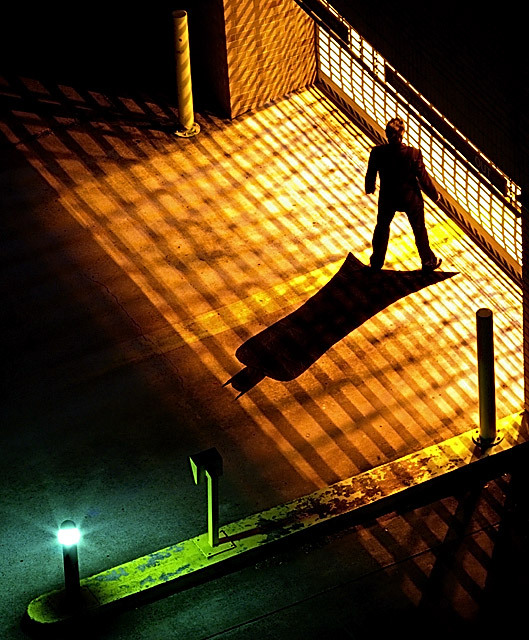 Fantastic shot and great morphing of the shadow. One of my top picks for the challenge! nice coloring, feels like a comic book. Oh God! I don't know how you did this but it is truly amazing. I love it! Good job - and in such a short period of time - I'm impressed. By far the best picture here, gave it a 10 ;) keep up a good work! Excellent, please post how it was done after the challenge. Ribbon...Now how did you pull this off? Awesome shot, this is so prefect! nice saturation and creative idea. but is it really <i>your</i> shadow? still, i like it a lot. Okay.... How did you do this? I love it. one of my ribbon picks -- hope you have the details of how you did this... great punches of color, the shadow is the story. I don't think you took a picture of your shadow. WOW!!! Amazing photo...added to my favorites. Interesting shot. Can't wait to see how you did it. Fantastic! I'm so impressed that you came up with this in 24 hours! It's a beautiful image, gorgeous colors, cleverly done. My favorite! Gosh, this looks like it is right off of my sons Batman video game. A 10! Wow! Given 24 hrs, wonderful take on the challenge. Great execution, too. 10. Congratulations in advance for this should win a ribbon, the idea is very creative .. Proudly hosted by Sargasso Networks. Current Server Time: 04/20/2019 08:18:27 PM EDT.